We're back on the Trail Ridge Road in Rocky Mountain National Park again in this post. My husband and I drove this road from the Eastern entrance all the way to the western exit/entrance of the park in early September, exactly one week before the horrible flooding that occurred in northern Colorado. Trail Ridge Road (US 34) is the highest continuously paved road in the United States, beginning in Estes Park, passing through Rocky Mountain National Park, and ending in Grand Lake, Colorado. 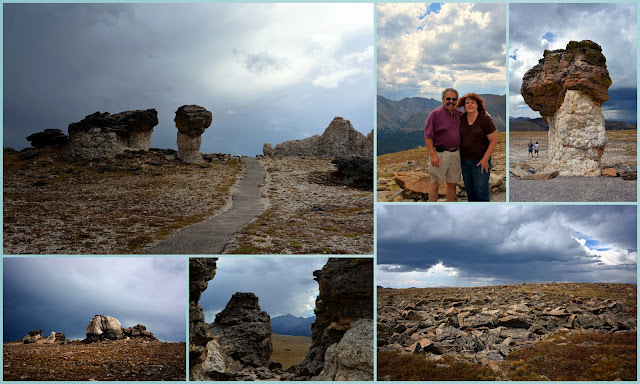 To see part one of my posts about Trail Ridge Road click here, and to see part two click here. We are still in the tundra area, at an elevation over 12,000 feet! 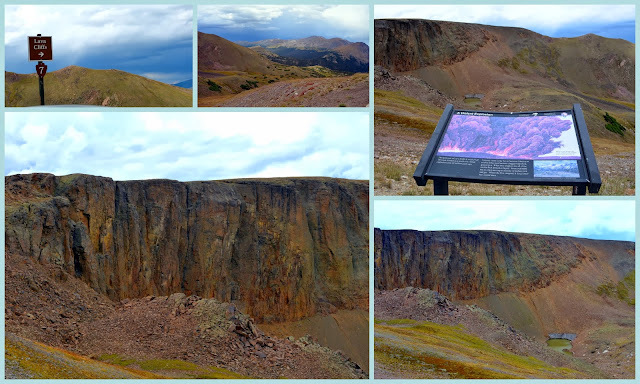 Our next stop was tour number seven -"Lava Cliffs," at 12,080 feet elevation. If you remember from my first post about Trail Ridge Road, I am using a companion booklet I bought in the Rocky Mountain National Park visitors center called "Guide to Trail Ridge Road," which gives us a brief description of what we are looking at for each scenic stop. The lava cliffs were formed between 29 million and 24 million years ago. That is an age I find hard to wrap my mind around! Volcanoes had erupted repeatedly in mountains eight miles to the west and deposits of volcanic ash and debris formed the rock we see here. The highest point on Trail Ridge Road is located at 12,183 feet between Lava Cliffs and the Gorge Range Overlook. The Gorge Range Overlook is a tundra protected area and offers views of the Gore Range which are 60 miles away. Click on the photo to read more about the range. Stop number 8 on the Trail Ridge Road tour was at 11,796 feet--the Alpine Visitor Center. The Alpine Center is located at Fall River Pass, the dividing point between the Fall River and Cache la Poudre River drainages. The rivers later meet in Greeley, Colorado, and join for the journey to the Gulf of Mexico through Platte, Missouri and Mississippi river drainages. I took this photo, of a photo of the Alpine Visitor Center in winter that was inside the center. (Click to enlarge and then click again to read it full size) The Alpine Visitor center is buffeted by extreme winds, especially in winter. The heavy logs on the roof support the structure's roof and catch snow, which helps prevent the roof shingles from being blown away. You can see how high the snowfall accumulation can be from this photo! Most of the high elevations of the Trail Ridge Road are closed during late fall into late Spring until the snow melts enough to be plowed and the danger of blizzards is past. 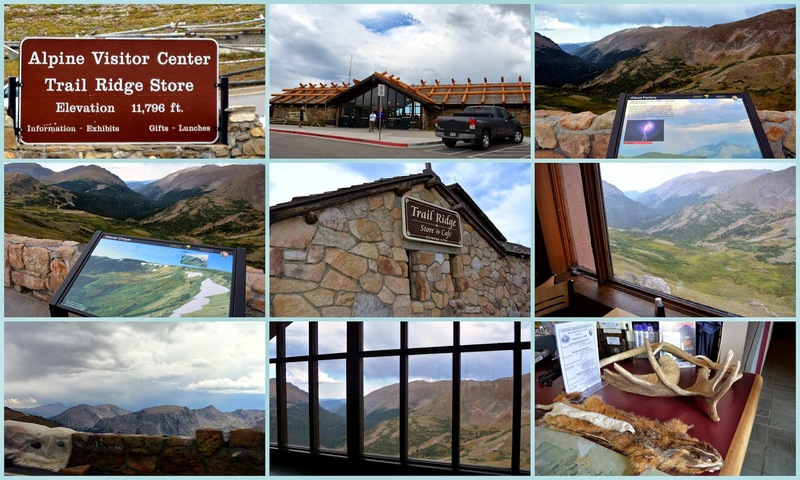 We stopped at the Alpine Center to have lunch, and shop at the Trail Ridge store to look at souvenirs. We also enjoyed a nature exhibit and ranger talk, and all the magnificent views we saw, both from our window seats in the self serve cafe and the outside veranda. At one point the skies opened up with a heavy rainstorm. From the Alpine Center's veranda, you can see the Glacial Cirque which was formed by glaciers that were once hundreds of feet deep. As the glaciers slid downward over two million years they scooped out this bowl-shaped cirque and formed a "U" shaped valley below. This placard explains why the Rocky Mountains are cloud factories. Almost every summer afternoon there are thunderclouds and thunderstorms here. One view we enjoyed seeing from the Alpine Center was this of the Old Fall River Road--the original, one way, a dirt-paved road that leads from the Rocky Mountain National Park's eastern entrance up to the Alpine Center, taking a different route from the Trail Ridge Road. My husband and I went back another day to take this drive, also, which I will show in a future blog post. Stop number 9 was at elevation 11,640 feet, Medicine Bow Curve. In the distance, the Medicine Bow Mountains extend into the state of Wyoming. The Cache la Poudre River is below in the glacial valley. There are examples of both tundra and windswept subalpine Engelmann spruce trees in this area. Next stop is number 10, Milner Pass, elevation 10,758 feet. Here lies Poudre Lake. 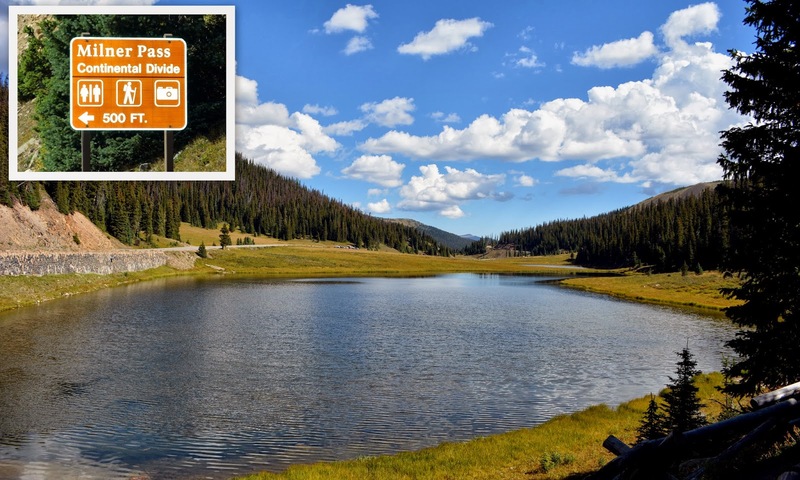 Milner pass was named for T..J Milner, an ambitious railroad promoter who surveyed a rail route from Fort Collins across the Continental Divide to points west. Like many surveyed routes of the 1880s, the railroad line was never built. Milner's Pass crosses the Continental Divide at this point. Stop number 11 is Fairview Curve at 10,120 feet. The same Colorado River that flows through the Kawuneeche Valley far below Fairview Curve later carves the Grand Canyon in Arizona! The great Glaciers that shaped this valley once extended more than 20 miles south of this point. 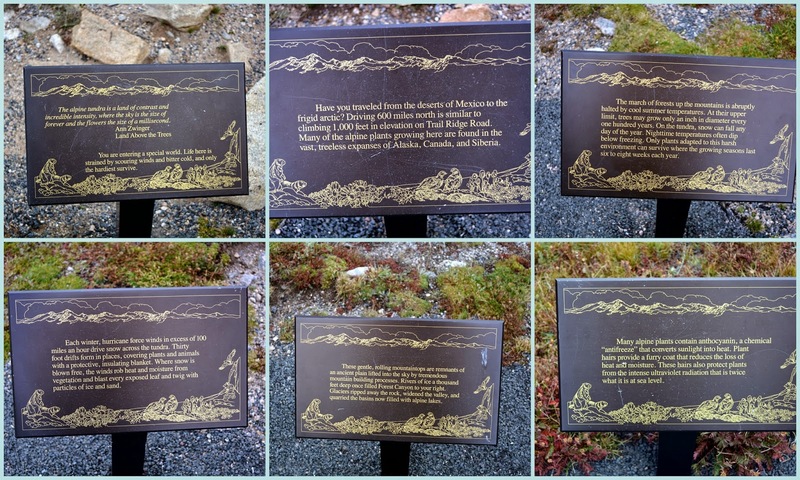 Click to enlarge to read this interesting placard about the Never Summer Mountains and the Arapaho influence on this area of the park. The Never Summer Mountains erupted with volcanoes between 29 million and 24 million years ago. Before the eruption, they stood about 2,000 feet higher. Erosion by streams and glaciers reduced them to their present height. We now descended to 8,884 feet to the last stop on our tour of the Trail Ridge Road--the Holzwarth Historic Site. In 1917 John Holzwarth Sr., staked a homestead claim in this valley with the intent of building a cattle ranch. After the Fall River Road opened the park in 1920, the ranch was redesigned into a popular resort known as the Holzwarth Trout Lodge. 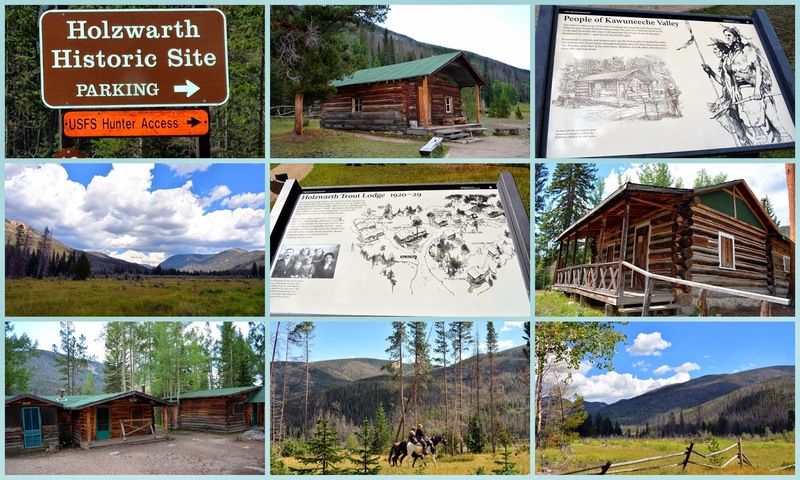 Now, this land is part of Rocky Mountain National Park and is preserved as a historic site. We walked the half mile trail to visit the old log cabin lodgings. We also saw these humble beginnings of the mighty Colorado River in the Kawuneeche Valley on the Holzwarth site! The river originates at La Poudre Pass and flows 1,400 miles through five states before it empties into the Gulf of California. My husband and I stopped at the Kawuneeche Visitor Center before leaving the western entrance/exit of Rocky Mountain National Park. 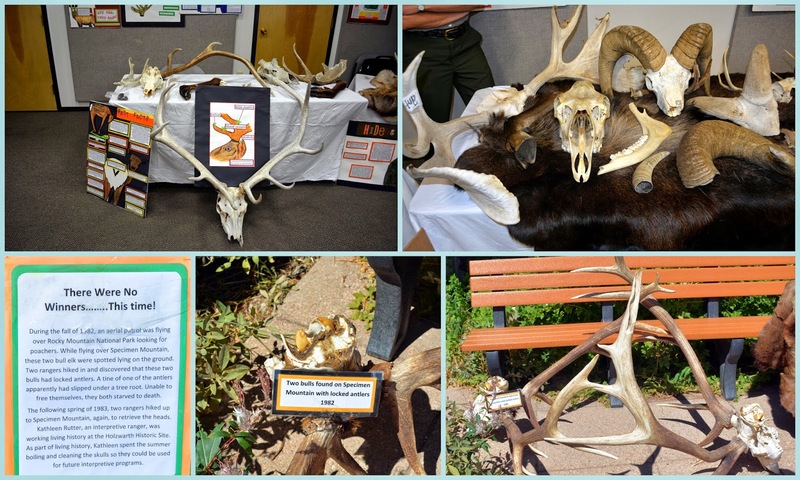 That day there was an interesting Ranger exhibit showing examples of skulls horns and antlers of the wildlife. Click to enlarge to read the story about what happened to two unfortunate elks, whose antlers can be seen in the bottom middle and bottom right. 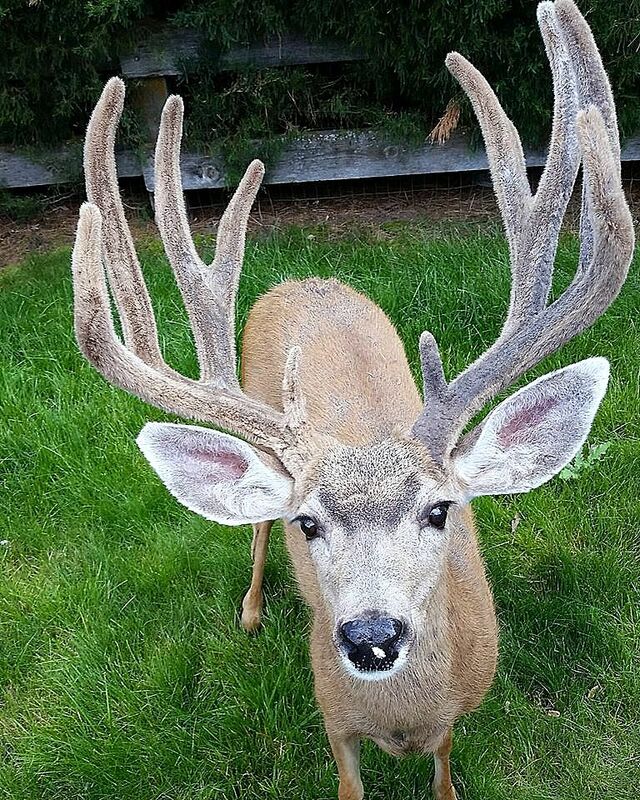 Talk about "locking horns"! After exiting Rocky Mountain National Park, US 34 leads into the heart of the town of Grand Lake. We drove to the lake to take some photos and then headed home. I hope you enjoyed all three installments of our drive from end to end of Trail Ridge Road-designated -one of America's designated National Scenic Byways and a national designated All American Road. It truly is a magnificent road to drive, and one that I'm sure we will be driving on again and again. "Climb the mountains and get their good tidings. Nature's peace will flow into you as sunshine into trees. The winds will blow their own freshness into you, and the storms their energy, while cares will drop away from you like the leaves of Autumn." Just look at the beautiful Rocky Mountain views we had on our drive up to the farm! Now that the mountain tops are snow-capped they really stand out against the blue sky. 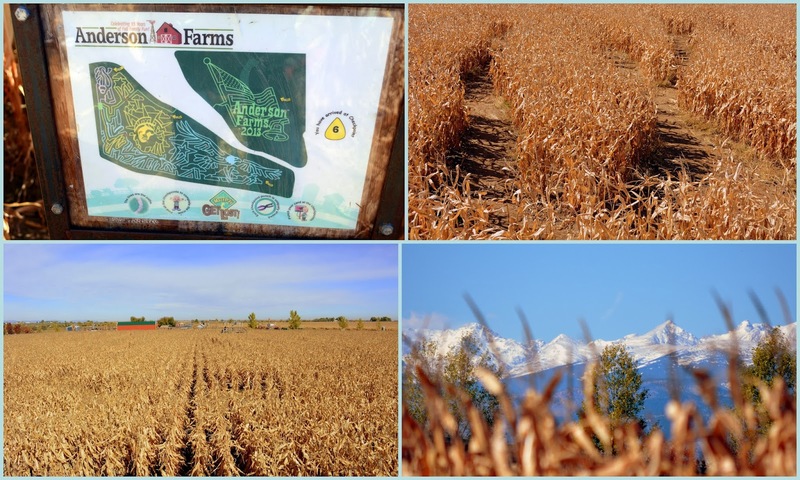 The Anderson Farms corn maze is thirty acres large with over nine miles of trails. Every year the corn maze design changes, and this year the design is the Statue of Liberty's face and arm holding the torch. To see last year's designs click here. Since we had very young children with us we did not stay in the corn maze very long--certainly not the two hours that the average visitor spends trying to find their way around the different paths. There is a free hayride, pulled by an antique Oliver tractor, out to the 30 acres pumpkin patch! 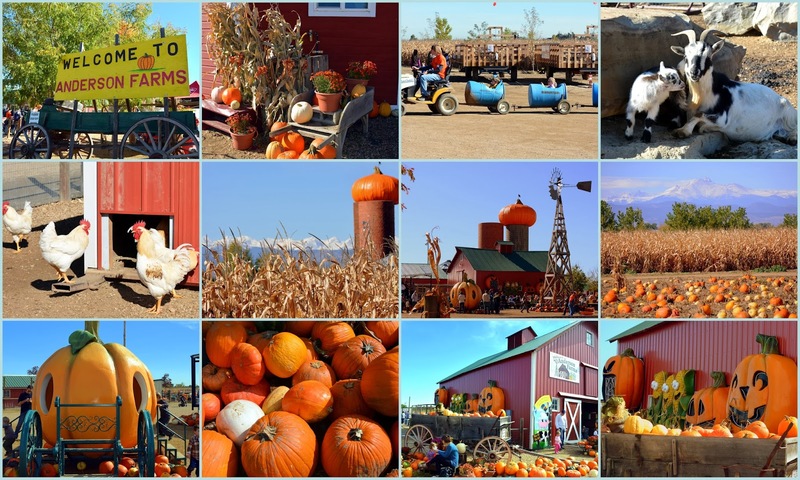 There are over 26 varieties of pumpkins, squash, and gourds to pick. 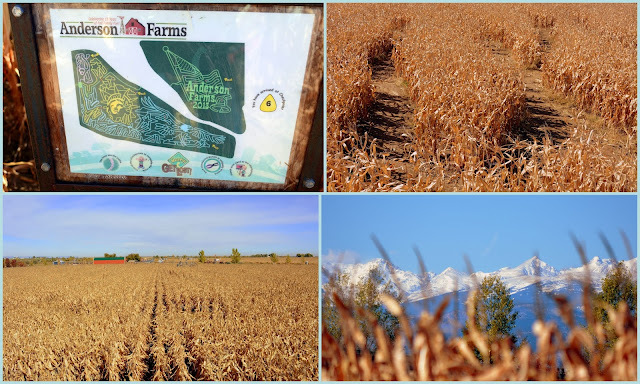 I loved the beautiful views of the distant mountains we could see in the distance, including the fourteen thousand (plus) foot high Longs Peak! 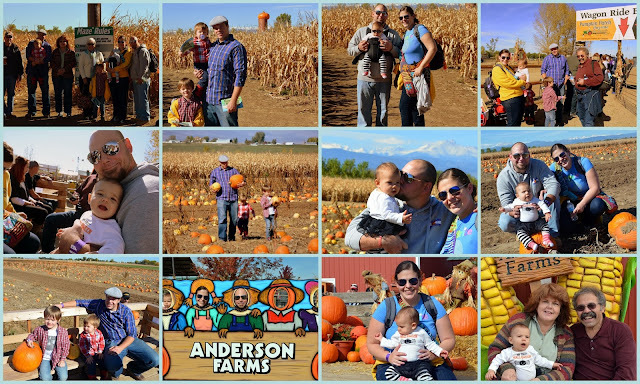 Some family photos of all the fun we had! Our children and three grandchildren enjoyed all the activities, as well as my husband and I. 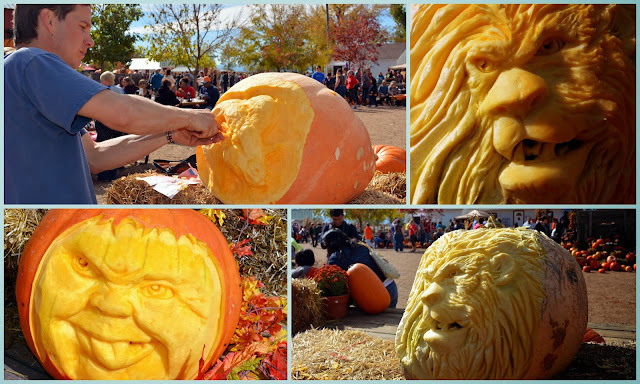 The farm pumpkin carver was hard at work and I found his designs amazing! 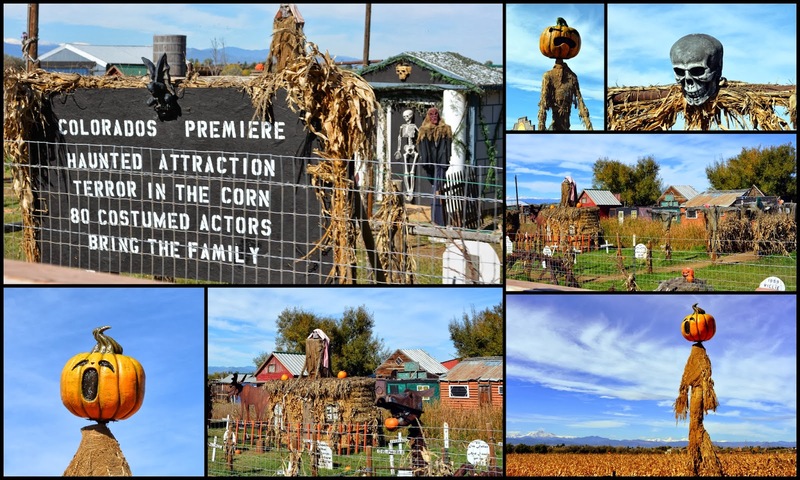 For those who enjoy the scary side of Halloween, Anderson Farms has a nighttime attraction called "Terror in the Corn," which is a "haunted hayride and ghost town" and nighttime "Zombie Paintball Hunt." ...and a view of Mummy Range. Hmmmm..what a perfect name for a mountain range this time of the year! I'm going to interrupt my Rocky Mountain National Park posts to tell you why I've been rather quiet the past two weeks, both on this blog and commenting on your blog. I was traveling! 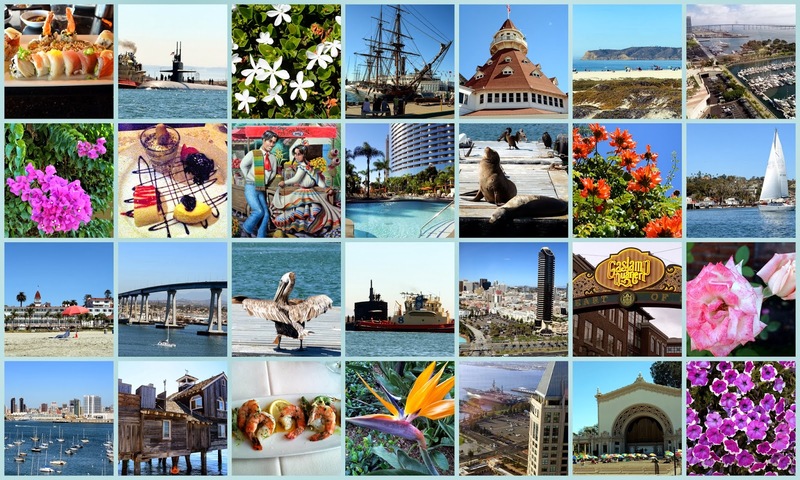 I had a rare break from full-time babysitting of my granddaughter during the week, to take two back to back trips--one to beautiful San Diego, California, and one to upstate New York, where we attended the wedding of our friend's daughter. California is one of my favorite states to visit--I have written almost 50 posts about this state that you can see under the label: California. When my husband had a business convention to attend in San Diego I was excited to be able to accompany him! This was my third visit to San Diego--you can see my prior posts about it under this specific label: San Diego. 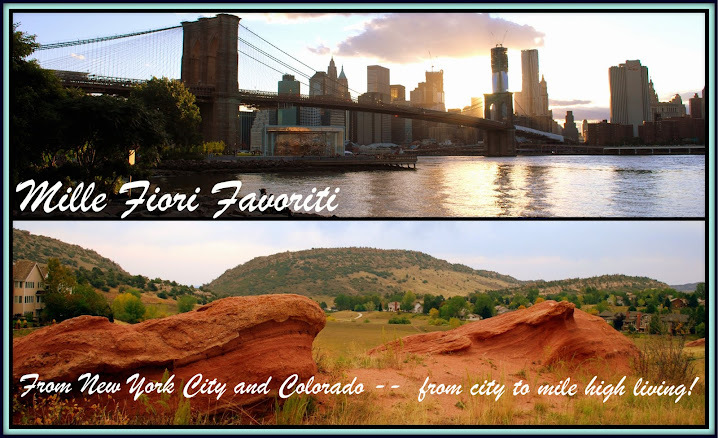 I think my photo collage tells the story of why I love this city so much. 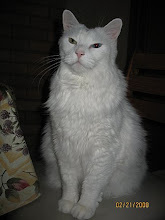 (You can enlarge this photo and all photos on this post by clicking on them once, and then clicking on it again to see it enlarge to full size). It really is a paradise on earth! It's year-round moderately warm temperature keeps it in bloom, and it's blue skies and Pacific Ocean Bay waters give it an azure glow. It is also a large US Navy base, so there are always carriers and other Navy ships in the bay to see, and I was fortunate enough to see a submarine changing crew out in the bay when I went on a seal boat tour. The city's historic Gaslamp District has some amazing restaurants, and I happily indulged in as much seafood as I could! I also finally heard a free organ concert at Balboa Park that is held every Sunday at the Spreckels Organ Pavilion-- one of the largest outdoor pipe organs in the world! 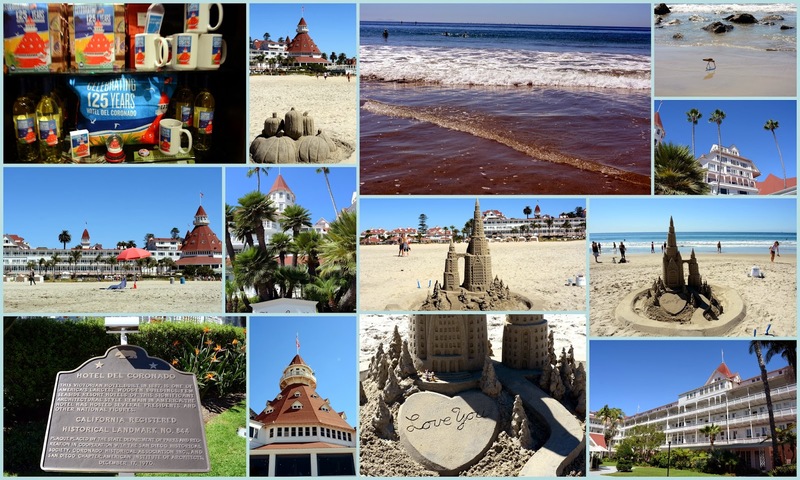 One of my favorite places to visit in San Diego is Coronado Island, located across the Coronado Bridge, and where the magnificent historic Hotel Del Coronado is located. You can read a prior post I wrote about the hotel at this link. The hotel is celebrating it's 125 anniversary this year! I enjoyed walking along the beach and dipping my feet into the Pacific Ocean again. It is always fun to see the creative sand castle structures that are usually on the beach--there were even some festive sand pumpkins! 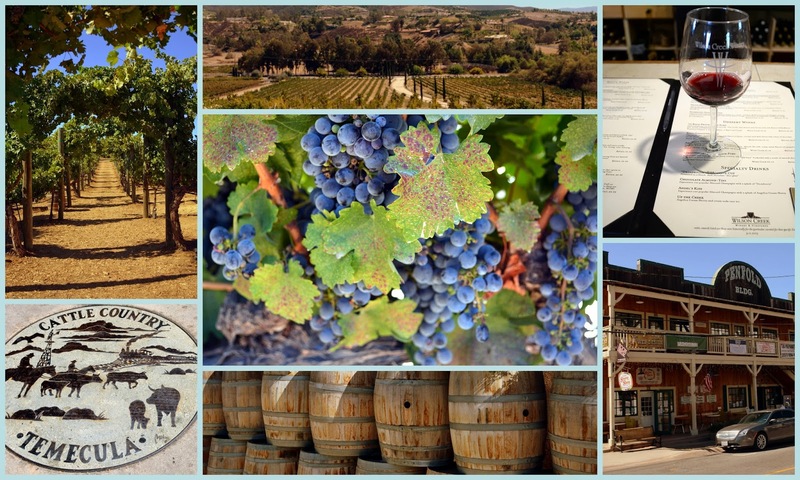 I was also able to visit the nearby valley town of Temecula, on a full day wine tasting tour of three different wineries. After leaving California, my husband and I flew across the country into JFK airport in Queens. 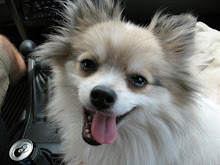 We then rented a car and spent the night at my brother and sister-in-law's home on Long Island. The next day we drove upstate New York to Rhinebeck, where we would be attending a wedding weekend. 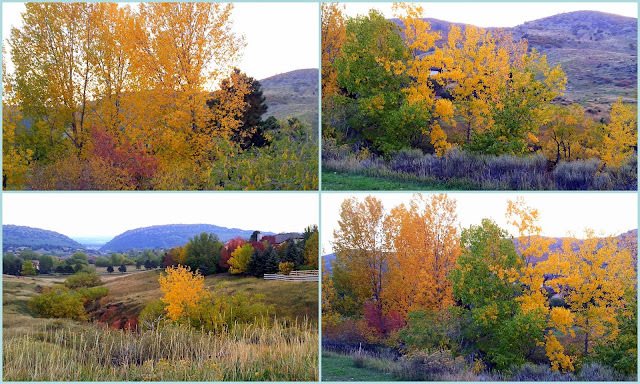 The further north we drove the more colorful the early autumn foliage became. It was such a pleasant drive! 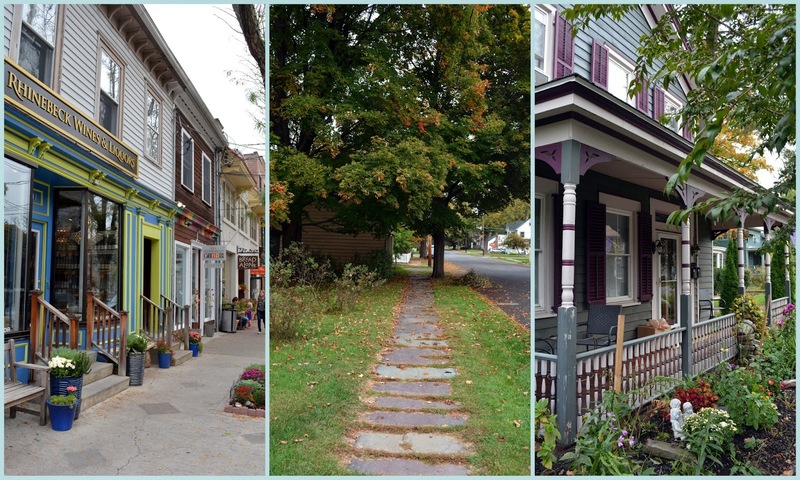 We stayed in the historic Delamater Inn in Rhinebeck. The Delamater was erected in 1844 and was designed by one of America's first architects, Alexander Jackson Davis, and is considered one of the finest examples of American Carpenter Gothic. 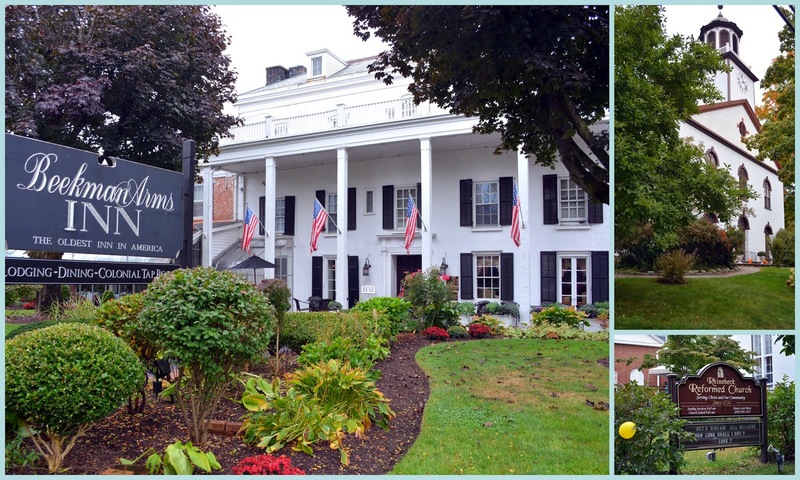 The Delamater Inn is part of the Beekman Arms Inn-- established in 1766, it is the oldest continuously running inn in America. It once housed Revolutionists George Washington, Benedict Arnold, and Alexander Hamilton. It was here that Aaron Burr and Hamilton exchanged insults that lead to their famous duel and Hamilton's death! Franklin Delano Roosevelt began every one of his political campaigns from the front porch of the Beekman Arms Inn. You can read more about the history of the inn at this link. Rhinebeck is full of historic buildings, including the Rhinebeck Reformed Church which you can see on the right of the photo collage above. 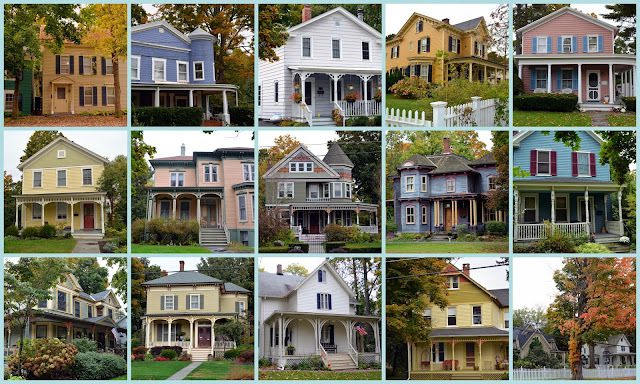 It was established in 1731 by Dutch settlers who formed Dutchess County, New York. They were having an apple pie festival on the weekend we visited, and we bought two pies to bring back to our NYC families. I could not resist taking photos of some of the delightful houses in the town. Each and everyone was well maintained and very appealing! There were many autumn touches everywhere I looked, and I felt fortunate to be here during one of my favorite seasons. Of course, the best part of the wedding weekend was the gorgeous wedding my friend's daughter had in nearby Germantown, New York. Her ceremony took place on the banks of the Hudson River on a spectacular autumn afternoon. They had their reception in a large tent on the historic property they rented for the day, with dancing in the refurbished barn space. My friend Rosemary not only made her daughter's dress by hand but all the decorations! Yes, she made these paper chandeliers, the wedding arch and even the linens for the tables. She is such a marvel! 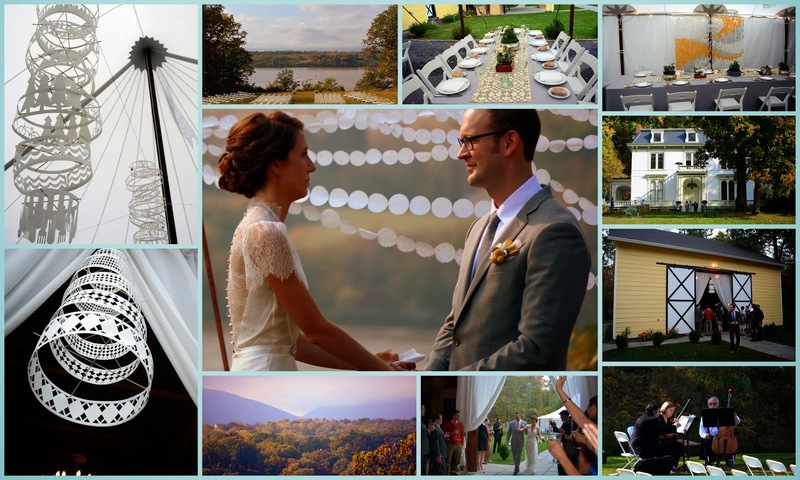 It was a stunningly gorgeous wedding! I'm now back home in Colorado, enjoying watching my neighborhood's aspen trees turn their fabulous shades of autumn gold! 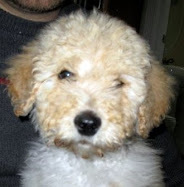 Unfortunately, I also came home with a bad cold which knocked me out a few days with sinus headaches and a cough. After babysitting all day all I had the energy for was to go to sleep. Thankfully, I'm all better now and will be catching up with you all as much as possible. 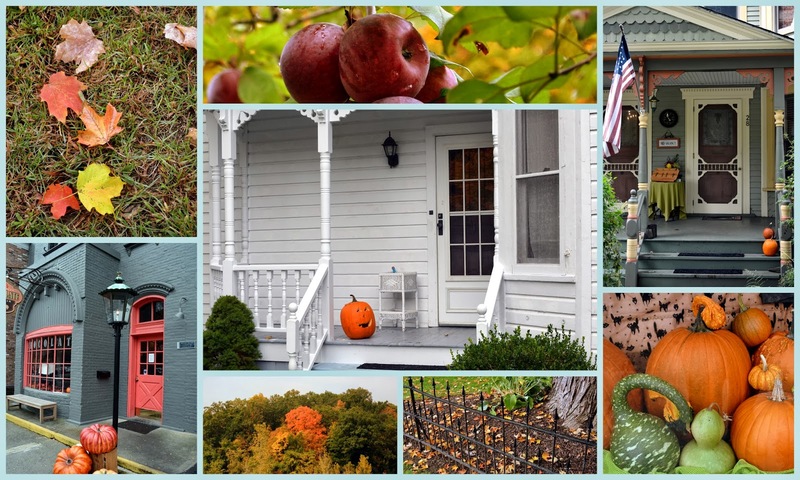 I hope you are enjoying this beautiful autumn season, wherever you live! In my last post, part one of the Rocky Mountain National Park Trail Ridge Road at this link, we traveled Trail Ridge Road--the highest continuously paved road in the United States--until we reached the alpine tundra region. We were at elevation 11,716 feet in the tundra protection area, far above the tree line, where winter conditions are harsh. Trail Ridge Road closes to the public before winter, for the safety of the public, and most times it can only be traveled in late spring through early autumn. Traveling the Trail Ridge Road at such a high elevation, one sees spectacular sights! We approach scenic stop number six, called "Rock Cut," at elevation 12,110 feet. Here, on the "Roof of the Rockies," the climate is very rigorous. Severe weather can come at any time. In fact, as we stopped and stayed for a while, threatening thunderclouds began to gather in the distance. Temperatures remain below freezing here all winter and sometimes even in summer, and there are frequent blizzards in winter. Luckily, the day we visited, the temperature was in the high 50's. Wind speeds here can exceed 150 miles an hours and ultraviolet radiation is extreme. We did see plenty of wildlife here--look closely at the photo above -- bighorn sheep! Just look at this handsome ram! In fact, there were quite a few Bighorn sheep rams looking for food on the tundra! As you can see, the sky looked threatening, but my husband and I decided we would hike up the Tundra Communities Trail to see the panoramic scenery and views of the tundra. The Trail Ridge Road pamphlet we were using (see my part one post) suggested that this one-mile trail would take 45 minutes to complete, and they were right! The trail was long and winding and very steep! It is only a little over a half mile long each way, but at 12,300 + feet elevation the oxygen level was 35% less than sea level, and I found myself needing to stop to catch my breath quite a few times. 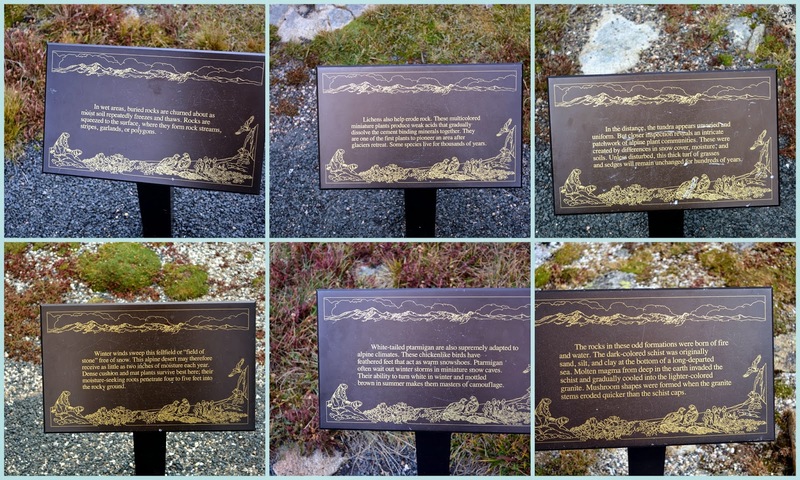 Fortunately, there were many informational plaques along the way that gave me a chance to rest as I stopped to read and photograph them. Again, click on them once, then again, to enlarge to read them. Despite the severe weather conditions, more than 100 species of flowering plants live on the stunningly rich tundra. Most plants are small, low growing and compact perennials. Many alpine plants are covered by hairs or waxy surfaces that reduce their water loss. Because we were visiting the tundra at the end of the growing season, in early September, there were not too many flowers in bloom, but we did see the tiny yellow ones above called Dasiphora fruticosa (shrubby cinquefoil). As we climbed we heard a squeaking sound - can you see what was making it way off in the distance, on the top of the hill? It was marmots! These relatives to the groundhog live in burrows and hibernate much of the year. They hide when they feel in danger, so we felt fortunate to have seen them. Beside marmots, pikas and ptarmigans live year-round at these elevations. Other wildlife such as ravens, hawks, coyotes, long-tailed weasels, bighorn sheep, and elk will also migrate onto the tundra during the summer months. We almost turned back on the trail a few times, as the sky above kept getting darker, and the hike became more strenuous, but since I came this far I was determined to reach the top! I made it! I was on the top of the Roof of the Rockies! It was such a fabulous thrill! Looking down, I saw another bighorn sheep running along the rocks of the steep cliff. How fast and agile these wild sheep are! I could see the four major mountains of the Mummy range in the distance, including Mummy Mountain, Chiquita, Ypsilon, and Chapin. On the other side, I could view the 14,000+ high Long's Peak in the distance surrounded by many 12,000+ high mountain tops. This really was being on top of the world and the feeling was indescribable! Now at a safe distance, the ram stopped running and posed beautifully for my camera. More ancient rock formations on the Roof of the Rockies, including the Mushroom Rocks that are formed of granite stems and schist tops. I was so thrilled to see all of these unusual sights but I did not want to linger much longer as darker thunder clouds continued to gather and lightning is always a danger at such high elevations. We walked back down the trail to our car, to go on to the next scenic stop along Trail Ridge Road. Our drive on Trail Ridge Road has more stops and more wondrous sights to see! Click here to read part three. Click here to read part one.